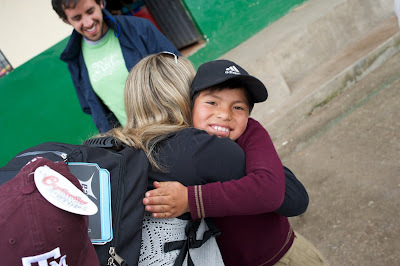 Joy is being connected with THE most adorable sponsor child in all of Ecuador. Joy is going to Walmart to shop for a 9-year-old man child. Joy is finding the perfect backpack to fill with things you hope a kid his age would like - a digital watch, legos, a transformer, underclothes, a Texas A&M ball cap, school supplies, sports equipment, and a flashlight. Joy is asking God to lead you in the right direction and sensing Him say baseball. 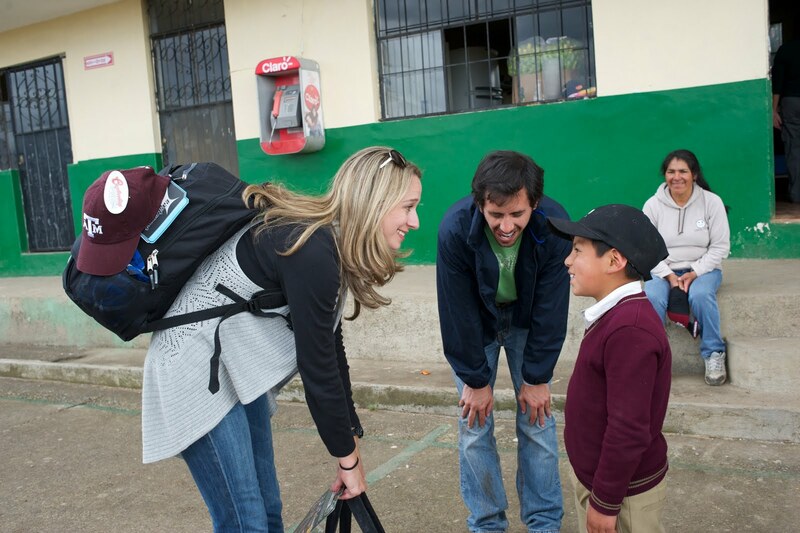 Joy is watching a little boy named Jhon open up his new backpack to find two baseball gloves and some balls. Joy is hearing that baseball is his most favorite sport! Joy is tossing the ball back and forth while learning everything you possibly can about each other in one hour. Joy is having a great translator who can make you feel at ease. Joy is finding out that Jhon and I have the same favorite pizza flavor - candian bacon and pineapple. Joy is hearing him say that although he doesn't go to church with his family, his favorite thing about his child development center is learning about God. Joy is knowing that even though his circumstances aren't ideal, he has a good family life. Joy is being asked by my sponsor child if I like horses. Joy is saying absolutely! Are you kidding me? Joy is finding out that his daddy is an excellent horseman. Joy is teaching Jhon how to use a mechanical pencil. Joy is seeing his name handwritten for the first of many times. Joy is a fightin' Texas Aggie ball cap that just happens to match his school uniform. Joy is a facial expression that says "I've always wanted one of these!" and hearing "Muchas gracias!" a hundred times. Joy is being slightly embarrassed to give underclothes to a 9-year-old, but getting over myself and doing it anyway. Joy is laughing really hard because the jeans you bought him are super long and he says he'll save them until he's thirteen. Joy is promising to write. Joy is waving goodbye through the bus window with a lump in my throat, but knowing that this is just the beginning of an important relationship...for both of us. Joy is helping a child. Will you share my joy? Again? Love the post! Such a privilege for us to play a small role. Wow Amanda,now that I have cried off all my makeup, I will go to church and share your amazing blog tonight and ask others to spread this joy!! Thank you for being obedient and reaching out, thank you for sharing your journey with us. Thank you. Precious JOY!!! Mmmm mm mmm. Praying still. Love to you! It's probably just a guy thing, but baseball being his favorite sport totally got me. Are you kidding, in Ecuador? What a reminder to listen to God even in the small stuff. Beautiful! Love this!!! Such visible joy in both of your eyes! Again crying with your JOY post. Reading this blog post was joy. It made my heart so happy! Praying for you & the team! Love your heart friend!! Tears filling my eyes. Thank you for sharing your joy, your journey and your heart. It's beautiful. Love you friend!! crying tears of joy. praying for you and jhon. He is adorable! I love that he loves baseball :) It is so wonderful to see u so filled with such sweet joy! Thank you for sharing your joy with us! What a tremendous marker of a day for both of you. Joy is reading and seeing how God knows and cares about so much in our lives...like the love of baseball and horses. What JOY to read all the ways God connected the two of you together. Still praying, Amanda! Can you bring him home with you? That smile! LOVE. Gladly sharing your JOY tonight! That is so, so cool. I'm feeling the joy! Oh my, tears are flowing,this certainly gave my heart joy. Just absolutely beautiful, my favorite post ever read! yep, lots of tears over this joyful post back in the states. the baseball part was when the dam broke completely. so many neat details! Joy is reading your story and looking at these pictures and seeing Jesus in action. Joy is looking at both of your faces and seeing joy. Joy is crying with joy over what a willing servant can do to influence a child's life for Jesus. This is so awesome. I had tears in my eyes reading this one and looking at the pictures. I'm thrilled the 2 of you got to meet in person. What a blessing it is to be a part of this young man's life. Praise God. Ah, joy indeed! How I'd love to meet and hug and love on our Compassion sponsor child in India. Maybe someday the Lord's favor will be upon us in that regard and we'll get to experience a similar joy to what you've described here. Blessings to you as you continue your journey. May the Lord be glorified! Amazing, simply amazing. With tears in my eyes I finished reading this...praying for you and the rest of the bloggers! I have a little Jhon, too. He's in Columbia. Love your joy. Love his joy. Oh ... you and your sweet JOY are just amazingly beautiful! This has me in tears. You are all just completely wrecking me. On my knees praying for you all. Love love love reading your posts each day! Thanks for sharing! ok - so I have a random off the wall request... 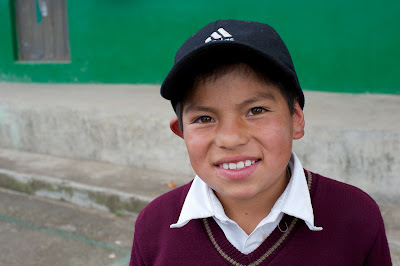 I have been in contact with compassion for awhile in the hopes of sponsoring a child (or a few) with disabilities. I would love to find some with limb differences because I just think that would be neat for both my kids & the sponsored child & how fun to visit someday... plus I would love to be able to develop a friendship with his/her mother and walk this road together with her. But compassion is having a hard time - at least with their online database- in finding me kids with disabilities to sponsor. I keep getting impatient & thinking of just going ahead & getting some kiddos but I feel like the Lord is asking me to be patient - I know He has the kids waiting for us that he wants for our family. I'm just having a hard time locating them! So - if it comes up when you are visiting the Compassion chid care centers - can you keep your eyes open for me for kids that need to be sponsored with a disability? And with my background in Spanish how fun if I could get a Spanish speaking kiddo? Ok - sorry for the terribly long comment... it just occurred to me that maybe you might be my in to finding the right kiddos for our unique family! We here are soaking up His words--your words. Keep rending all that good, friend. We're feasting. And lives are being changed all over. Your church is praying for you--little to big and back to little things. So happy for you to get to meet such a great kid! Thanks for sharing your experience! We are praying for y'all! Thank you for giving us a glimpse into Ecuador! What JOY!! Reading all of the team's blogs is melting my heart for sure! Praying for you all!!! Tears of JOY running down my face! What a blessing that you had such a wonderful time with your sponsored child! Love you Amanda and your post! I'm so glad that I didn't put my make up on before my quiet time today. I am a bawling mess. You and Jhon are so beautiful and the love of God's heart! His tenderheartedness towards you and that village touches my heart deeply. Bless you and your team.....God's"Fruit" is bursting forth! I cannot wait to meet the two girls I sponsor in Tanzania one day. Blessings to you. Praying with tears this morning. Seeing your pics helps me more clearly imagine what it would be like to meet my Compassion child. You are so blessed - so is Jhon & so are we. Thanks for going & sharing. God cares about the biggest to the smallest details of his life- so sweet! Joy is reading your post. Joy in the reading . . .Joy in knowing a precious child will have a new sponsor today - thanks so much for sharing, for inspiring, for serving. Continuing to pray for you. Beautiful post! Sponsoring through Compassion really is a joy. I'm praying for you and for all the kids waiting for a sponsor. God bless you! Love the post! And to see you actually meet your sponsor child and all the joy that was on his little face is priceless. Keep sharing the love! Thanks! Tears streaming down my face. Thank you. Such a beautiful post. So awesome. Still praying for you all. What a blessing to meet your sponser child. Ours is in Indonesia - oh, we would love to see him in person someday! Thanks for sharing your heart. Praying for all of you bloggers in Ecuador. Thanks for this post! Love how God led you to baseball stuff. He is so awesome!! You made me cry! You must feel so blessed as you are such a blessing those in Ecuador. I feel blessed just reading about your experience! You have such a beautiful heart, Amanda! That is just UNREAL. I have loved seeing God in the coolest, tiniest details this week (bulldogs, mega queso chips, maroon, baseball). I'm going to borrow your prayer before we go to Cambodia--God, give me your insight into these kiddos' hearts and what would make them smile most. Through tears I say thank you for sharing your joy with us! Praying for your time there. Beautiful. I wish I were there with all of you. 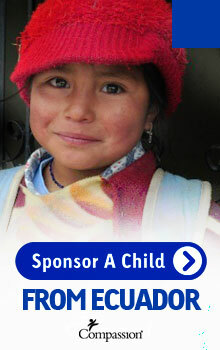 My sponsored child is in Bolivia, but I would love for you to hug one of these precious little ones for me. God bless and protect you all and give you wisdom, strength, and courage in all you do. Amanda, thank you for persevering in your writing. It has been so encouraging to me. Joy is reading your blog for the last few years and wondering about Compassion. Joy is to feel the pull and finally adopting a perfect girl in Kenya. Thank you for your words. Joy is that I can't wait to meet her and spent time looking in her eyes. In the meantime she is on my mind and in my prayers. Thank you so much, you have helped me listen better and discern what the Holy Spirit has been saying. Love, strength and Peace to you. LOVE the last pic of you and him. Following the blogs and so touched by this. You are a stranger to me, I know. But I was so moved by the Joy post from last year so I feel blessed to see another come across. I wanted to shout WhoHoo! For the the Holy Spirit leading you to baseball! Wow! "Oh, How He Loves Us!" Goodness. Can't even type because of the tears. Thank you Amanda. Praying for all of you. Praying for all the children in Ecuador. Praying for lives to be eternally changed because of this trip. Joy is participating with the Compassion bloggers through prayer and getting to read updates like this. The baseball, pizza, and mechanical pencil connections were my favorite details. I love it when God does that. That. Is. Awesome. I love this post! Ya'll are made for eachother! Tears of JOY running down my face! This was beautiful. Love this! We have experienced the same joy in meeting our compassion child. What a privilege and joy you have in spending time with him and being on this trip! And I love that you are sharing it with us. I can't wait to read more! So so sweet!! Love this! I'm in tears that God led you to buy baseball stuff and Jhon loves baseball. I love that our God is into the details. 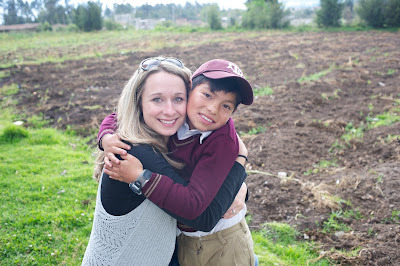 How awesome to be able to meet your sponsor child! I sponsored a boy (now man) in Africa for 11 years, and it would have been so amazing to see his face in person. I can't even fathom the joy! Joy is leaking from my eyes readin this post. Wow, God is so good! I am loving being in Ecuador with you and Ann, Melanie, Sophie and Kelly, Shaun and the Compassion team through your posts. Following and praying as you lavish His love on so many. I love Compassion!! Such an inspiring post! Thank-you! What a bright smile that little boy has! Amazing and beautiful! Thanks for sharing your story. How privileged you are to get to visit the child you sponsor! And how awesome to see God select, through you, the very things your child likes! I read this blog with my 11 year old son and we looked at the picture in this one and others you sent. He was eager for us to sign up to sponsor a boy around his age. We entered his birth date month and day and got only on match. It was a boy in Ecuador who is one year younger than him. We signed up to sponsor this boy. My son is so excited and asked all sorts of questions. Your blogs made this all seem so real to him and gave him a good imagine of what life it like for these kids and how we can help. Praise God for that. So thankfully you shared this trip with us and that you made it home safely. thank you so much for sharing this, Amanda. This post brought tears (of joy!) to my eyes...it's so wonderful to see how God is working through Compassion...what a blessing to be a part of this ministry! praying for all of you! Joy is reading/seeing this encounter through your post. I'm sobbing right now. God is so good and I feel your joy in a tangible way. Thank you so much for going and for sharing the journey with us. We have a little girl we sponsor in Nepal who we will probably never meet but I feel like she's just a little more real after seeing your post about Jhon. Really enjoyed this post. Especially the A&M baseball cap! Whoop! Thank you for bringing the world of Compassion to your readers. I just wanted to let you know that I'm catching up on some blog-reading, and just read this post for the first time. It is exactly what I needed today, as my heart is turned toward delighting in Christ, and as I'm thinking about my upcoming trip to Haiti. I have been so discouraged, but this sweet post just blessed me so! Thanks. "The Night Max Wore His Wolf Suit"